Maurice Halsted has been identified as one of Chicago’s most talented and well diversified djs. His sets include house, Top 40, techno, rock, progressive, hip hop and unique mash up combinations. He is one of the original founders of the mash up style of mixing and has pioneered his way into the air waves of millions throughout the US. Maurice Halsted has also opened for multiple artists including: Ice Cube, Rihanna, Lady Gaga, Flo Rida, Kevin Rudolph, Ludacris, Trey Songs, Jay Sean, Oranthi, Jason Derulo, Kelly Clarkson, B.O.B., Justin Bieber, Blake Lewis, Iyaz, Kaci Battaglia, Sean Paul, White Tie Affair, Jaiko, Boys Like Girls, Cobra Starship, V Factory, Kristina DeBarge, Emii, Sean Kingston, Kesha, Carmen Reese, Livvi Franc, Chiddy Bang, Pitbull, Cee Lo, Taio Cruz and more! DJ Katy – Chicago’s Legendary! With over 10 years of experience playing out for crowds several times a week, DJ Katy has become a recognizable face known for rocking parties all over Chicago and the surrounding suburbs. She has an uncanny knack for anticipating what the crowd wants to hear and delivering at precisely the right time, bringing them back to her clubs week after week. Katy’s djed in all types of venues ranging from megaclubs hosting over a thousand people to intimate sports bars looking for a good party. Ultimately describing herself as a “party music dj,” she keeps things fresh by performing several guest spots and festival stages each month while maintaining steady residencies multiple nights a week at the hottest clubs…include Studio Paris, Roof on the Wit, RPM, Board Room, and more. At the age of ten, Julian recorded mixes on cassettes. Thirteen years later, he held four college DJ residencies and was crowned Red Bull Thre3Style U champion at the number one party school in the US; the University of Illinois. Agent J is a professional. His mastery over the energy and atmosphere allows him to create a memorable party at any venue or occasion. He has earned a record of consistently being a crowd favorite. On any given weekend, his open format style can be heard all over the city of Chicago including notable clubs such as Concrete Cowboy, Y Bar, Joy District, and others. It all started in a college dorm room at the #1 party school in the USA, the University of Illinois at Urbana-Champaign. The young freshmen went from creating mixes for his friend’s pre-games to DJing all over the university. He quickly got booked at bars, frat parties, day parties, private events and even landed a contract with the university for school events. While there he opened for notable acts at the Canopy Club. DJ Noize moved to Chicago only one year ago and has already played at Joy District, Deuces and Diamond, Key Club, Estate Ultrabar, and many more. He understand how to show the crowd a good time through a diverse knowledge in music, a friendly face, and energy. It’s easy to see why his fans follow the Noize all over the city! DJ Kayleigh Chaos has mixing in the clubs for the past several years. Her music format and versatility will keep you dancing all night. From hip hop nights, EDM nights, retro nights and much more, this queen of themed music will entertain you all night. DJ Chris Mix – Chicago’s Legendary! DJ Chris Mix is defined by one word: versatile. He is a perfectionist at his craft and can command any genre and decade of music. His DJ sets are eclectic, yet very modern while remaining pop focused and dance centric. Born and raised in Chicago, moving to the bright lights of New York City, around the world and back again, Chris has come back to his hometown playing at Chicago’s premier nightlife venues weekly and has a high profile client list spinning for high end fashion events! If you could describe him a a drink, you’d have to order something with southern laid back smoothness, western classic american flavor, eastern spirituality with a hint of northern privileged attitude. DJ subXero’s unique blend of life, creates his unique blend of style and sound. Carrying inspiration from the deep southern pockets surrounding Houston, TX with the windy city cool of a Chicago born and raised diehard househead, he started out djing in 2002 and has gone on to establish himself as a magnetic force in the second city. Carrying years of DJ affiliations with worldwide sound enthusiasts networks, he’s held residencies at top Chicago nightlife destinations, held guest DJ slots on Chicago FM stations and dj’d worldwide podcast broadcasts. Although he’s limited in availability these days as he travels the path from DJ to JD, his one night performances will leave you satisfied for the remaining 364 days. Order up a subXero for NYE…ice cold. You won’t regret it. DJ SubXero will be spinning live at the official NYE Pre Party! Dj PM, representing Chicago, Los Angeles, & San Francisco has been spinnin’ parties and holding his ground since 2001. His unique style & creativity of djing has attracted many across the country; opening in the likes for such acts as Jay Sean (Young Money Rec), Dj Flipside (B96/ Jump Smokers), Raghav (Ultra Rec), Fabulous (Def Jam Rec), Orisha Sound (Spectra Rec), and many more. By crowd pleasers, his sets include original production and remixed mash-ups of House, Top 40, Hip-Hop, and a special 80’s & 90’s old school set. Dj PM is currently residing in Los Angeles and is spinnin’ in venues, such as House of Blues Hollywood, Falcon Ultra Lounge Hollywood, & The Viper Room. 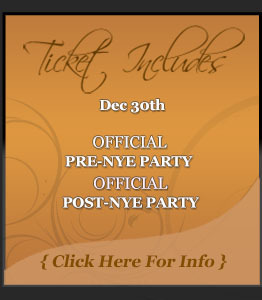 DJ PM will be spinning live at the official NYE Pre Party! Naveen Kumar is one of the hottest DJ/Producers coming out of Chicago. His unique style of spinning attracts crowds from far and wide. Naveen is not a prisoner to any one genre and this can be seen in his live sets and productions. Naveen Kumar’s talents have been most credited for his production efforts. Producing tracks for artists such as Michael S., Na Palm, and Young General, he is turning his name into a household presence. His tracks have been signed to the prestigious PERFECTO RECORDS, ARMADA MUSIC, and ZOUK RECORDINGS. His music has been supported by TIESTO, PAUL OAKENFOLD, MARKUS SCHULZ, PETE TONG, GARETH EMERY, and countless others. His mashups have also been getting massive support from A-List Dj’s like Tiesto and Paul Oakenfold. As a DJ, Naveen Kumar has opened for some of the biggest acts in the industry, including Jay Sean, Asher Roth, Raghav, Imran Khan, RDB, and many more. DJ Naveen Kumar will be spinning live at the official NYE Pre Party! Don’t miss the finest DJs in Chicago spinning a great mix of Hip Hop, 80s, Top 40, Retro, House, and the Latest Hits. Michael Issac is a stand-up comedian and actor from the south side of Chicago. As an actor he has done several corporate films, live performances and television commercials for companies such as McDonalds, Walgreens, Old Navy and Walmart. As a stand-up comedian, Michael has made Zanies Chicago his comedy home where he performs regularly as the Host and Feature. Michael Issac’s brand of comedy is “Good.Clean.Funny.” His dynamic stage presence combined with his charismatic delivery is quickly making him a favorite to audiences of all ages and backgrounds.